Don’t be sad that Girl Scout cookie season has passed. 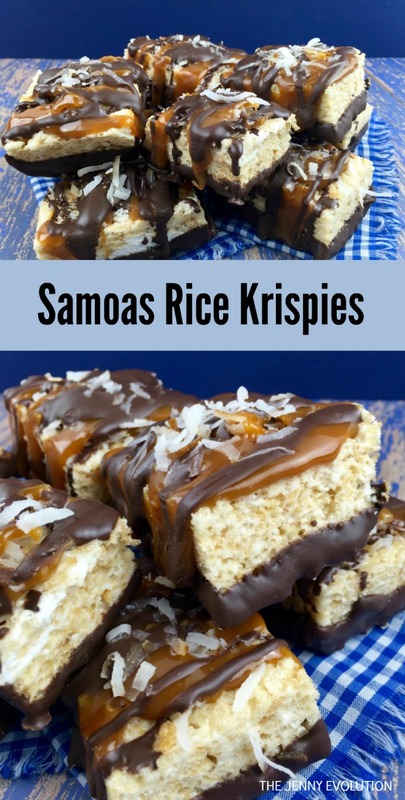 This recipe for Samoas Rice Krispies is going to cheer you right up! Out of all of the Girl Scout cookie flavors out there, Samoas are my personal favorite. Hands down! Oh all of that chocolately coconutty goodness. And no… those aren’t real words, but who cares! They express my love for these cookies. Last year, my husband greeted a Girl Scout at our door and ordered a couple of boxes but not my beloved Samoas. As he was closing the door, I casually asked what he ordered. And when we realized what we had missed ordering, he opened the door, yelling, “Girl Scout girl! Girl Scout girl.” We still laugh about how ridiculous we must have seemed… but a girl’s gotta have her annual fix! As many of my regular readers know, I just love recipes with a twist to them. Like last week I featured some carrot cake cream cheese swirl bars… no need for typical carrot cake! So while I’m a complete sucker for regular Samoas, if you like these Girl Scout cookies, you’re going to go nuts over homemade recipe for Samoas Rice Krispies! 1. Spray a 9 x 9 pan with vegetable spray and set aside. 3. Add the marshmallows to the melted butter, stirring constantly. 4. Once the marshmallows are melted, remove from heat and stir in the cereal and salt(optional) until well-coated. 5. Transfer the cereal mixture to the prepared pan and press down firmly and evenly. 6. Allow the Rice Krispies to cool in the pan completely. 7. Line a cookie sheet with wax paper. 8. Cut the Rice Krispies into 9 to 12 squares and place on the cookie sheet. 9. In a double boiler, melt the solid shortening. 10. Add the chocolate melts and stir occasionally, until melted. 11. Pour the melted chocolate into a microwave safe bowl that will make it easier to dip the bars. 12. Dip each Rice Krispies bar half way into the melted chocolate, covering the bottom of each bar. Place on wax-covered covered cookie sheet (bottom side up) and chill for 10 minutes to allow chocolate to “set.” Set aside remaining melted chocolate for later. 13. Toast the coconut in the oven or on the stovetop. I just toasted mine on the stove top in a frying pan over medium heat until it browned- takes about 5 minutes. 14. Flip the bars over and press the toasted coconut into the top of the bars. Set aside any remaining coconut. 15. Microwave the caramel dip according to package instructions. 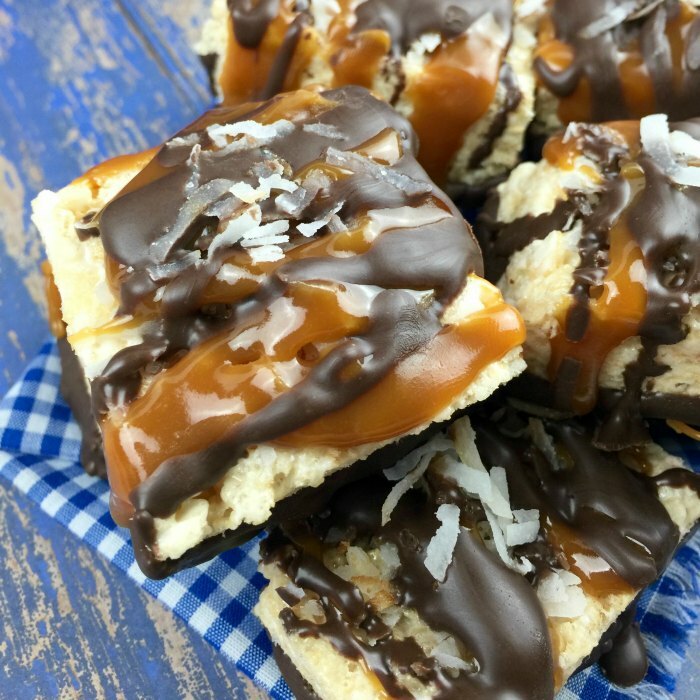 Using a spoon, generously drizzle the caramel sauce on top of each Rice Krispies bar. 16. Reheat the remaining chocolate by microwaving in 10 second intervals until completely melted. 17. Drizzle the chocolate on top of each Rice Krispies bar. 18. Garnish with remaining coconut. Find more scrumptious recipes on Mommy Evolution! For more cookie inspiration, consider the following! Don't be sad that Girl Scout cookie season has passed. 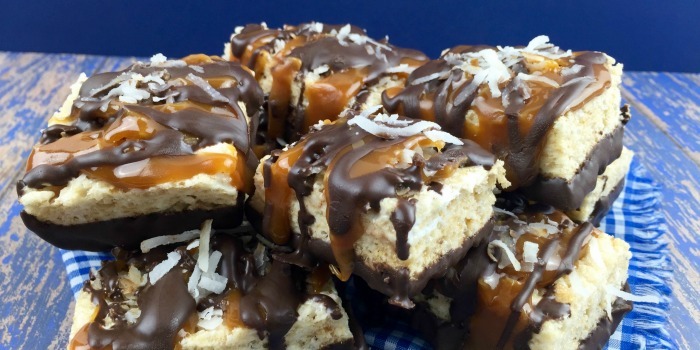 This recipe for Samoas Rice Krispies is going to cheer you right up! Spray a 9 x 9 pan with vegetable spray and set aside. Once the marshmallows are melted, remove from heat and stir in the cereal and salt(optional) until well-coated. Transfer the cereal mixture to the prepared pan and press down firmly and evenly. Cut the Rice Krispies into 9 to 12 squares and place on the cookie sheet. In a double boiler, melt the solid shortening. Add the chocolate melts and stir occasionally, until melted. Pour the melted chocolate into a microwave safe bowl that will make it easier to dip the bars. Dip each Rice Krispies bar half way into the melted chocolate, covering the bottom of each bar. Place on wax-covered covered cookie sheet (bottom side up) and chill for 10 minutes to allow chocolate to "set." Set aside remaining melted chocolate for later. Toast the coconut in the oven or on the stovetop. I just toasted mine on the stove top in a frying pan over medium heat until it browned- takes about 5 minutes. 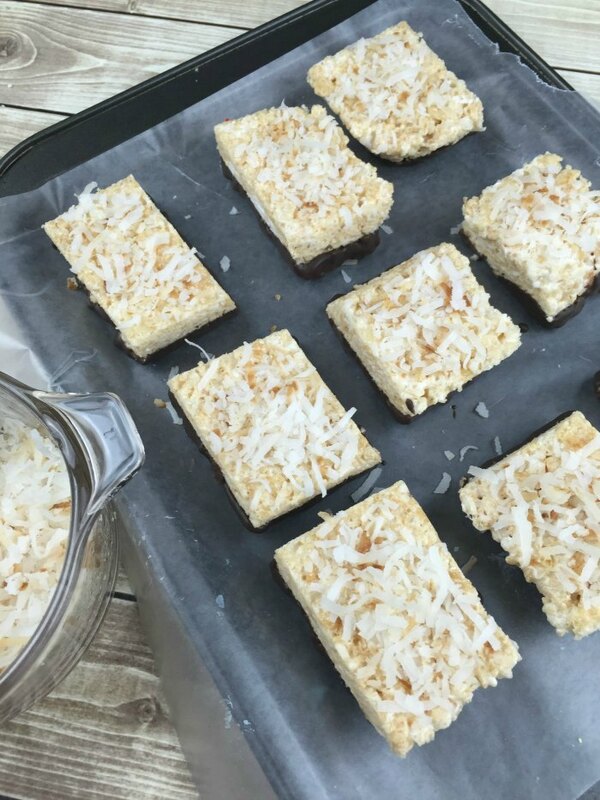 Flip the bars over and press the toasted coconut into the top of the bars. Set aside any remaining coconut. Microwave the caramel dip according to package instructions. 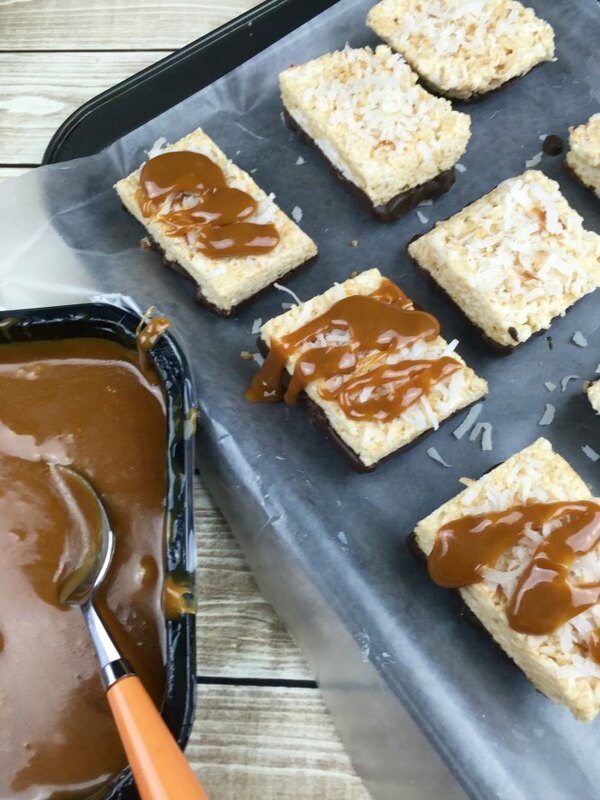 Using a spoon, generously drizzle the caramel sauce on top of each Rice Krispies bar. Reheat the remaining chocolate by microwaving in 10 second intervals until completely melted. 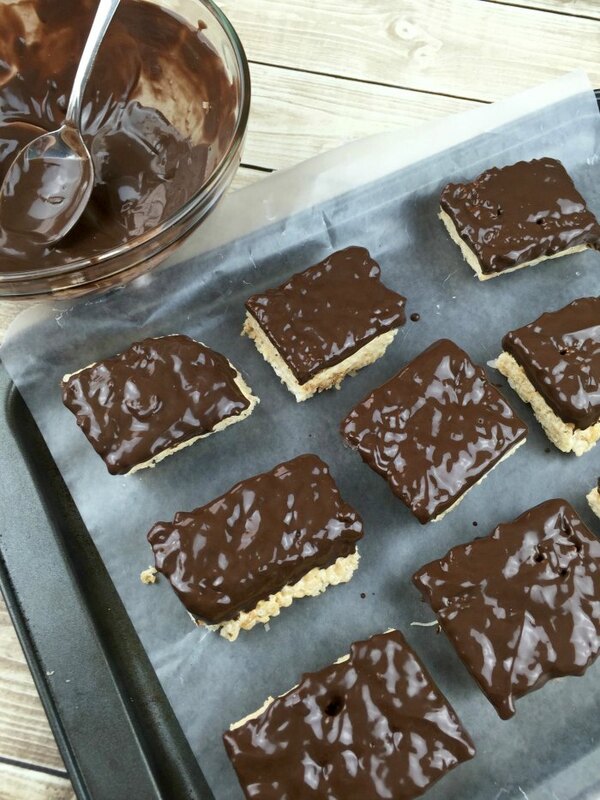 Drizzle the chocolate on top of each Rice Krispies bar. How did I miss this girl scout cookie?!?! It must be soooo yummy!! I love anything featuring rice crispie!! HA! I have to say… these are awesome. And you don’t need Girl Scout cookies to make them yourself… all from scratch 🙂 Happy eating! Wow these are glorified Rice crispies, they look dangerous!! 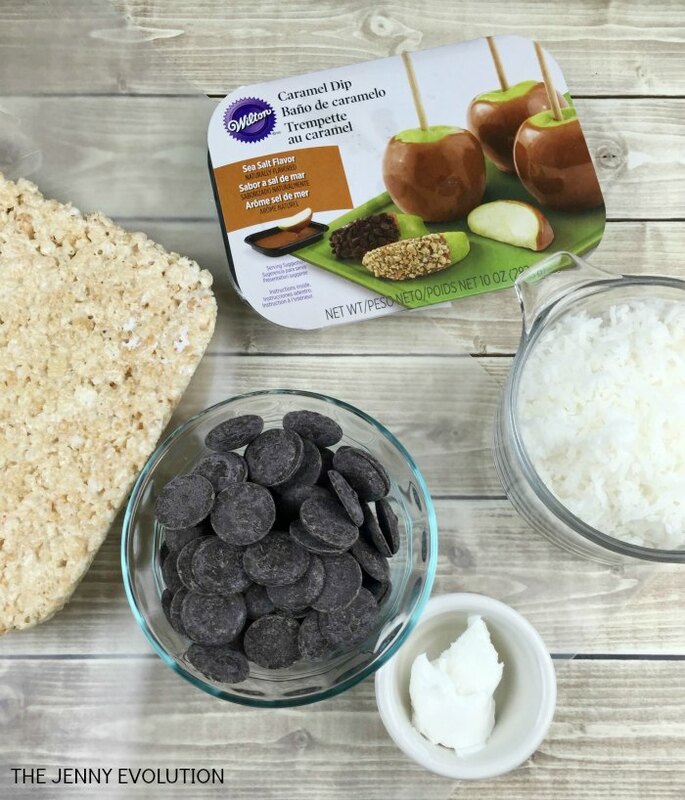 ok – I don’t do rice crispy bars, but these I think I would try – they look AMAZINGLY good!! 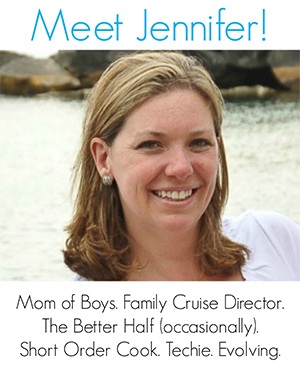 Thanks for sharing on the “What’s for Dinner” link up!